The aim of this article is to give the reader confidence in the accuracy of the fulfilment of the prophecy in Daniel chapter 9 and provide vindication of God’s Word. Jesus places his stamp of authority of Daniel’s prophecy as a whole (Matthew 24:15; Mark 13:14) yet regarding the Seventy Weeks there are several interpretations and the prophecy has challenged the minds of many regarding its fulfilment, seldom with success. Some sources even separate the final week from the remainder of the time (seldom with proof). One of the problems is the establishment of the start date for the 70 weeks prophecy. For many years historians have incorrectly taken BC 465 to be the year when Artaxerxes I came to the throne. This article objectively examines the situations at the start and end of the prophecy. It then checks that the intervening time span is, in fact, 70 weeks (or more specifically 69½ weeks to the crucifixion because the Messiah was cut off in the midst of the week (Daniel 9:27). This is 486 years and six months on the day for a year principle (from Ezekiel 4:6)). Without doubt the fulfilment of the prophecy relates to the time of our Lord Jesus Christ because looking at the components of Daniel 9:24 we have the following New Testament verses providing a fulfilment for each one. To make reconciliation for iniquity In other words make atonement – in Romans 5:11 we also joy in God through our Lord Jesus Christ, by whom we have now received the atonement (RV reconciliation). This is just one way in which the accuracy of Daniel’s prophecy is proven. Modern methods (specifically astronomical dating) can pinpoint events to within seconds and these can be compared with historical records to establish an accurate baseline. Such methods were not available until recently. 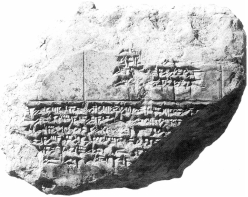 Work done by Dr Gerard Gertoux compares with astronomical data the contents of this tablet (BM 32234 in the British Museum) which contains the fact that there was a total lunar eclipse in the third month (June) followed by a partial one in the eighth month (December). In between these there was the death of Xerxes in the fifth month (August). 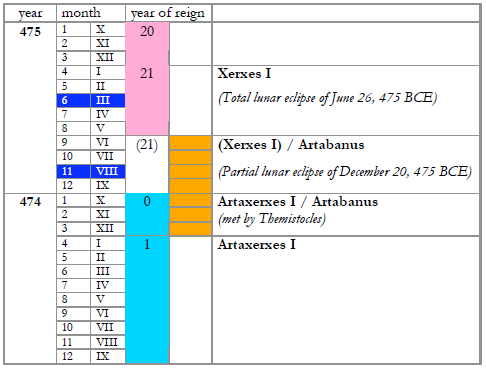 The Five Millennium Canon of Lunar Eclipses shows for BCE 474 the fact that on June 26th BCE 474 there was a total eclipse of the moon and on December 20th of the same year a partial eclipse (see below). 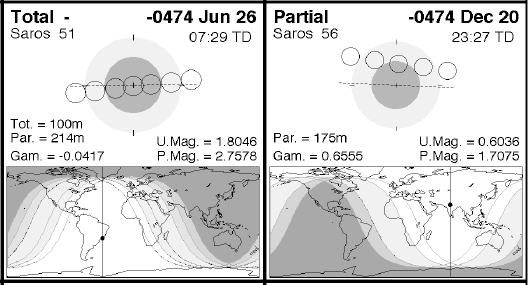 The table shows the two lunar eclipses (in deep blue). Xerxes I was killed on August 24th BC 475. There was no king immediately following (Artabanus was only a legal representative) and Artaxerxes I acceded between December 25th BC 475 and January 5th BC 474. Therefore Artaxerxes’ first year began in April BC 474 and his 20th year is 19 years on, which is BC 455 and this is the year of the decree. Historians have taken for granted an accession year of BC 465 because there were two lunar eclipses in that year. One was on June 5th being partial and the one on November 29th being total. These are the wrong way round so BC 465 is an incorrect choice. Of the several possible decrees which were made at the time, the one in Nehemiah 2:8 is the only decree which mentions the restoring and rebuilding of Jerusalem as mentioned in the prophecy. We have fixed the starting point at BC 455 and we will now look at the ending point. It was in the midst of the 70th week that the Messiah was cut off and he was preaching for 3½ years so he started preaching after 69 weeks, that is 483 years, when Jesus had attained the age of 30. It is therefore important to establish the time of his birth. Herod was in a poor state of health and the description of his condition is rather unpleasant. He was taken to Jericho in an attempt to help him recover, but he died soon afterwards. Various remedies were unsuccessfully tried on Herod and he died 18 days after the eclipse. Herod’s survivors determined that certain elders who were imprisoned should be allowed home – a further week. An elaborate funeral procession started in Jericho and the time taken for this would bring us to five weeks after the eclipse. The procession travelled to Jerusalem at the rate of a mile a day, followed by a 30-day mourning in state, instigated by Herod himself. We are now at least 8 weeks from the eclipse. Archelaus and the immediate family then needed 7 days private mourning – 9 weeks after the eclipse. After Archelaus had finished this he returned to his normal executive office and then came the Passover. 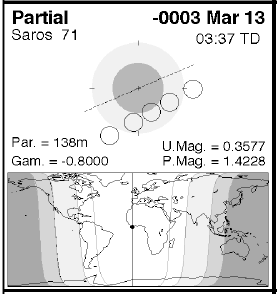 There was a partial eclipse of the moon at 3:37 a.m. on March 13th BC 4. This is the one which one would base a BC 4 death of Herod on, and for at least 200 years this has been assumed to be true. 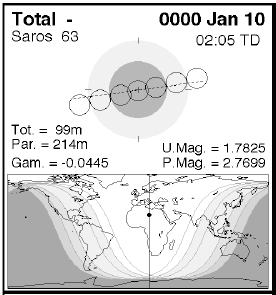 Looking through the schedule of lunar eclipses, the only other likely candidate for a total or partial lunar eclipse to be seen in the Middle East was at 2:05 a.m. BC 1. This is a total eclipse, centred over North Africa. The table below shows for each of these two years, the date of Herod’s death (18 days after the eclipse) and the date of the next Passover (Abib 14th) with the number of intervening days. The eclipse of BC 4, being partial, was less likely to be recorded. Even if it was, there is simply not enough time between this eclipse and the Passover for everything to happen. For the eclipse in BC 1, there is certainly enough time, so this is quite conclusive evidence that Herod died in BC 1. The first 10 verses of 1 Chronicles 24 list the courses which were set up and we find that it was the 8th course which was attributed to Abijah and Josephus confirms this to be still in being. He adds that they changed every Sabbath at noon week by week. 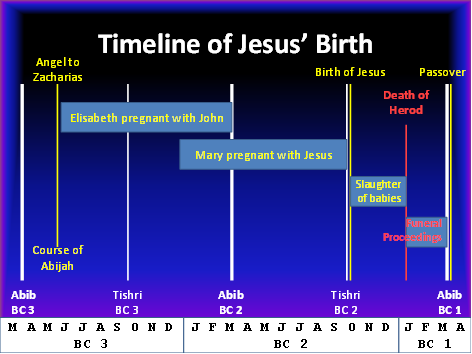 We now trace through the timeline of the birth of Jesus and we begin by picking a year when Jesus was a baby when Herod had all the male babies slaughtered we start at 1 Abib, BC 3, which falls on a Monday, 18th March. This shows the progression of events from the time when the angel gave the revelation to Zacharias until the Passover following the death of Herod. 8 weeks after the first Sabbath in Abib takes us to 18th May and a further week brings us to 25th May when Zacharias was released from his duty so Elisabeth could have conceived any time up to 2nd July, BC 3. The sixth month of Elisabeth with child and Jesus’ miraculous conception brings us to 2nd January BC 2. A further 40 weeks after this if Jesus was born at full term brings us to 9th October BC 2 which is 10th Tishri and is the Day of Atonement. Luke chapter 2 verse 1 describes when Caesar Augustus had caused everyone to be taxed. (It would have been expedient for Caesar Augustus to have this done when everybody was in Jerusalem for the Feast of Tabernacles). Adding 30 years to Tishri BC 2 brings us to Tishri AD 29 which is when Jesus began to preach and 3½ years later brings us to Abib AD 33 which was the month of the crucifixion. Tiberius became equal to reign with Augustus in AD 13 until Augustus’ death on 19th August AD 14. The Senate convened on 18th September AD 14 to make Tiberius the sole ruler. Under Roman law, this year is the accession year and his first year does not start until AD 15. 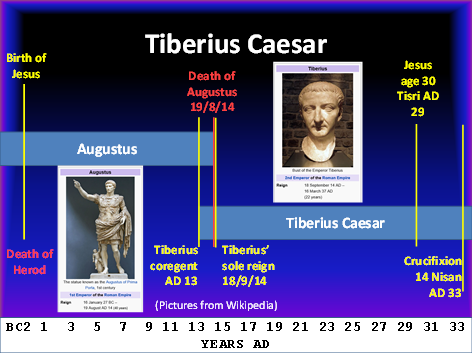 This being Tiberius’ first year means that the 15th year is 14 years later which is AD 29. This is in line with Jesus beginning to preach in Tishri of the same year. John 2:19, 20 mentions this and the evidence for the date of Jesus’ ministry and therefore the crucifixion cannot be so definitely determined but at least it is compatible with an AD 33 crucifixion date. The death of Herod, Caesar Augustus’ ascension and possibly the temple being 46 years in building all lead to AD 33 being the year of crucifixion for Jesus. We come now to calculate whether the start date and the end date tally – and this table shows that they do. Christ’s ministry Jesus preached for 3½ years and was then cut off so this is the midst of the 70th week. There are 455 BC years plus 29 AD years and we have to deduct 1 because there is no year zero to bring the time difference from 20th Artaxerxes to the start of Jesus’ ministry, and this is the beginning of the 70th week. Jesus was crucified in the middle of this week as prophesied by Daniel. (As to the remainder of the last week this could possibly be the baptism of Cornelius). The start and end points of the Seventy Week Prophecy have been identified with conclusive evidence for a BC 455 start and an AD 33 date for the crucifixion of Jesus which is in the midst of the final week. It is hoped that this article eliminates the uncertainty which has been seen in this prophecy for many years and provides one more piece of evidence to show that the Bible is the Word of God and is a book to be relied on. May it be that we wait in the faith given to us by His Word for the return of our Lord Jesus to the earth as King. * This article was first published in the November 2016 issue of The Christadelphian and is reproduced here by kind permission of the Christadelphian Magazine and Publishing Association, Birmingham, England. The one year difference between Gertoux’ representation and the Astronomical representation arises from there being two calendars in use for years before Christ. Astronomical dating has a year zero whilst Gertoux uses historical dating which goes straight from BC 1 to AD 1. Josephus states that the temple was started in the 18th year of Herod’s reign but there is uncertainty as to how this is counted, on account of whether it is counted from him being declared as king by the Romans or when he has disposed of Antiogonus.